A familiar sight to seafarers in the days of sail were the uninhabited Diego Ramirez islands, a Chilean possession, about 60 nautical miles south west of Cape Horn. They are actually the peaks of an undersea mountain range. They were a hazard at night or if several days of cloudy weather prevented a sight being taken. Seamen of the day coined this sobriquet ‘The Dagger Ramereez’ which tended to replace the correct pronunciation. Falls of Clyde was built in 1879 at Glasgow by Russell & Co. for the Glasgow Falls Line who named all of their ships after Scottish Waterfalls. She was initially employed in the India trade, taking out general cargo, steel products and cement and returning with jute or rice. She often went to Australia, New Zealand, China and North America and loaded many cargoes of wheat from US west coast ports. 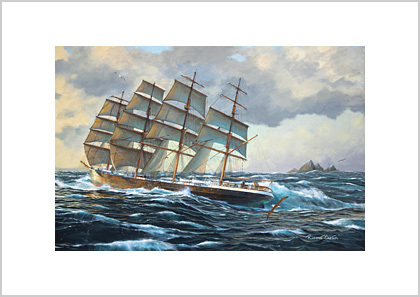 In 1898 she was bought by Captain Matson of San Francisco who put her in the Hawaii trade. 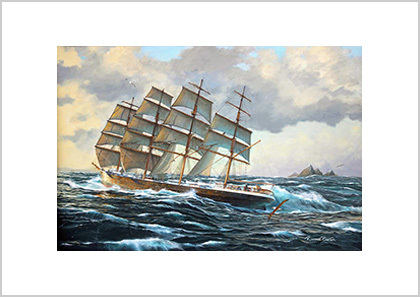 In 1907 he sold her to the Associated Oil Co. of California and she became a sailing oil tanker still in the Hawaii trade. General Petroleum bought her in 1920 and she made just one more voyage under sail before being converted into an oil storage barge. After 37 years at Ketchikan in Alaska she was towed to Honolulu to become a stationary exhibition ship for the Hawaii Maritime Center. Re-rigged as the four-masted ship as she was originally built, she is listed in the National Register of Historic places. Falls of Clyde led a varied life and is still afloat in Honolulu as a museum ship. 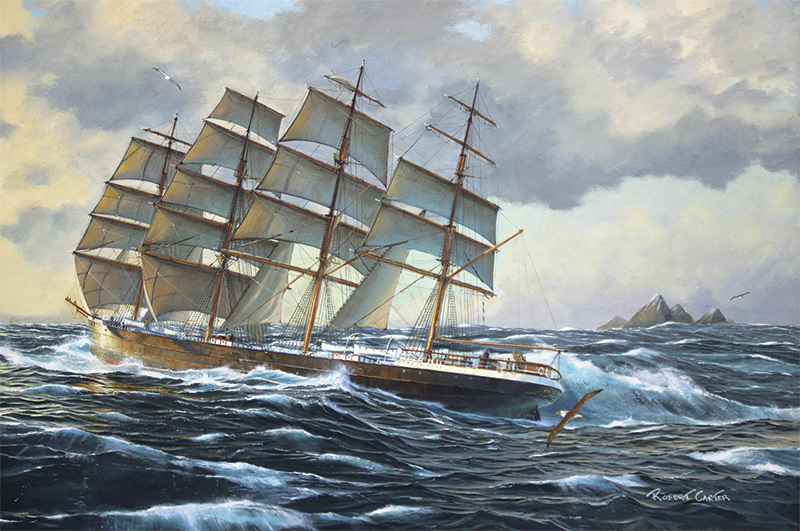 In 2018 a syndicate has been formed to return her to Scotland, where it is hoped she will be restored to sailing survey. 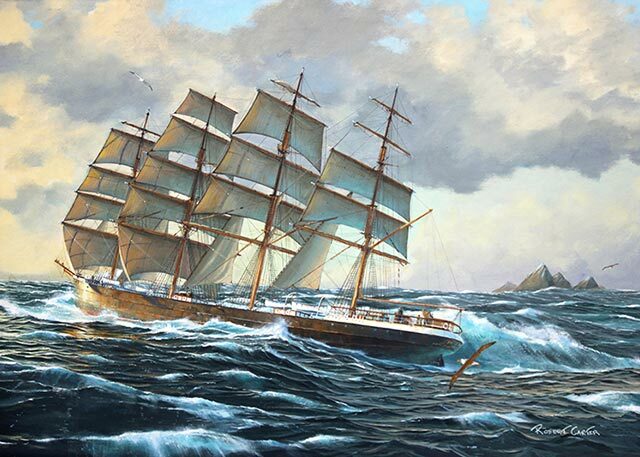 A percentage of all sales of this print will be forwarded to the Friends of Falls of Clyde group to support the ship‘s restoration. Falls of Clyde off the Diego Ramirez islands, about 60 nm SW of Cape Horn.